Anthony McCall is known for his ‘solid-light’ installations, a series that he began in 1973 with his seminal Line Describing a Cone, in which a volumetric form composed of projected light slowly evolves in three-dimensional space. Since creating this ground-breaking piece, McCall has had work exhibited at museums and galleries throughout the world, including the Museum of Modern Art, New York; Tate; Whitney Museum of American Art; Serpentine Gallery; Centre Pompidou; Moderna Museet, Stockholm and Hamburger Bahnhof, Berlin. Examining McCall's work of the 1970s and the pieces developed since his return to making art in 2003, the conversations explore McCall's over-riding preoccupations as an artist whose work occupies a space between sculpture, cinema and drawing. In doing so, the book also narrates how McCall has transformed the way he understands his own practice, particularly in relation to notions of performance, the body, projected installation, durational structure and spectatorship. 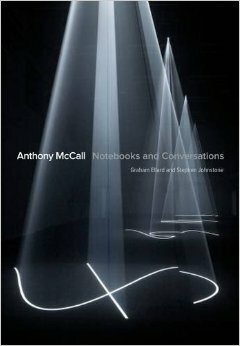 Emphasising both the continuities and shifts in McCall's working methods in the studio over the last 40 years, Anthony McCall: Notebooks and Conversations presents unique insights into his extraordinary body of work.Contents: Introduction: Thinking in notebook form, Graham Ellard and Stephen Johnstone; Conversations - Tate Britain, London;10 September 2004; Centre Georges Pompidou, La Maison Rouge, Paris; 5 October 2004; Anthony McCall Studio, New York; 3 March 2005; Ellard and Johnstone Studio, London; 25 March 2006; Ellard and Johnstone Studio, London; 20 March 2011; Gallerie Martine Aboucaya, Paris; 22 October 2013; Flims; Performances; Slide works; Chronological list of notebooks; Biographies.About the Author: Graham Ellard and Stephen Johnstone have collaborated since 1993. Their large-scale video installations and 16mm films, concerned with the parallels between film and architecture, have been exhibited in galleries and museums internationally, including Tate Liverpool; Museum of Contemporary Art, Sydney; Centre Pompidou; the Internationale Kurzfilmtage Oberhausen; The Aichi Triennale, Nagoya and Tate Britain. Graham Ellard is Professor of Fine Art at Central Saint Martins, University of the Arts London. Stephen Johnstone is Professor of Fine Art at Goldsmiths, University of London.